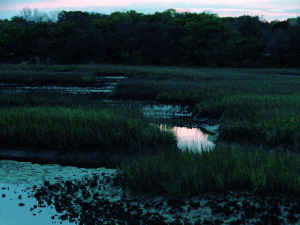 Now that I have a house in Charlotte where I will live exclusively after next year, I know that one thing I will miss most about Florida is my beloved marsh. I live on the edge of a wonderful marsh. Houses curve around a hill with a wonderful view of Vaill Point Marsh, where every day there are blue herons, ibises, pelicans, and, once, a gorgeous pink flamingo, all standing like mannequins from central casting, bird-knee deep in water that has the property of changing hue with the time of day. 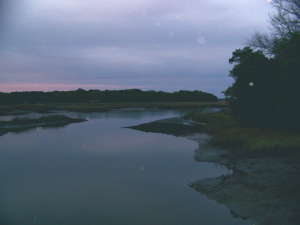 Almost every morning and evening, my way winds along this marsh. 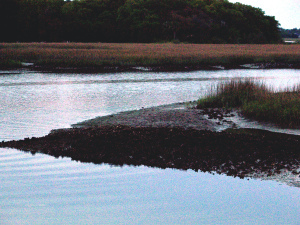 At daybreak and high tide, the water glistens like a mirror, reflecting the light, it seems, a moment before it brightens around me, so that it appears the marsh begins to glow with sunlight an instant before our star breaks over the Intracoastal Waterway to our east. 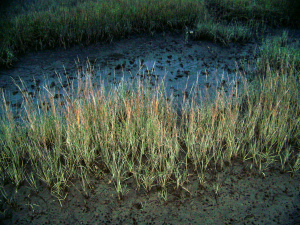 As evening falls, the marsh takes on the colors of the sunset, softening and spreading them like sunbutter along its edges.